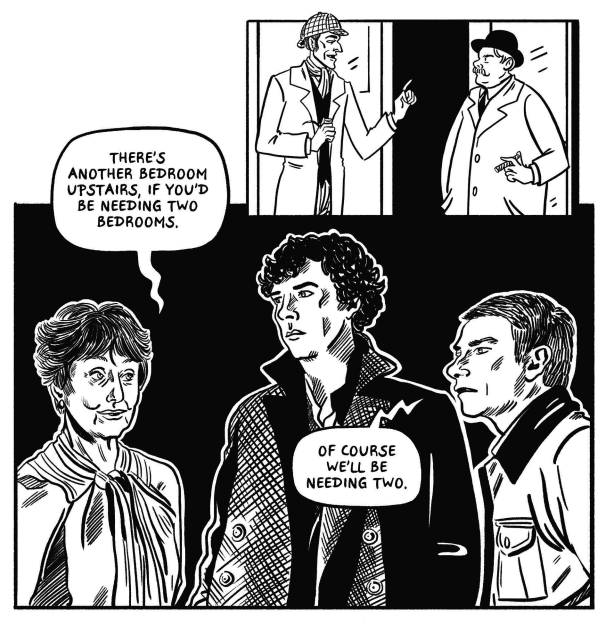 Meg-John Barker and Julia Scheele’s Queer: A Graphic History (Icon Books, 2016) traces the origins and journey of queer theory through bite-sized explanations and accompanying illustrations. It is part of the Graphic Guides series from Icon Books, which takes on big concepts and theorists and makes them accessible to a broad public audience. The guides “introduce engaged readers to advanced subjects in a fun and accessible way by the revolutionary means of non-fiction comic books”. The academic/historical/(auto)biographical graphic novel is not a new concept (that’s a whole different blog post), but as a form of public history sits somewhat outside of mainstream go-tos of what is considered ‘public history’ (popular books, museums, archives etc). 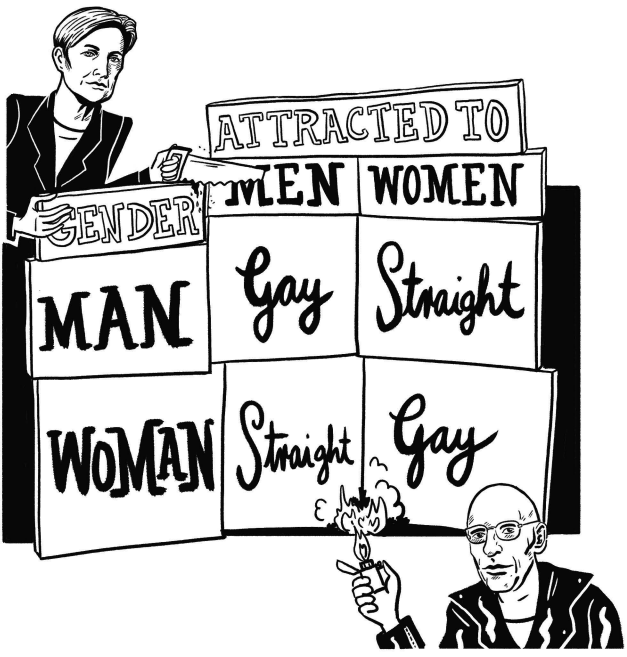 Queer: A Graphic History uses – and maybe even queers – many of the conventions of academic and public history. It presents a complex idea in an attractive way, and encourages the reader/audience to ask questions not just about the topic but about the wider world. 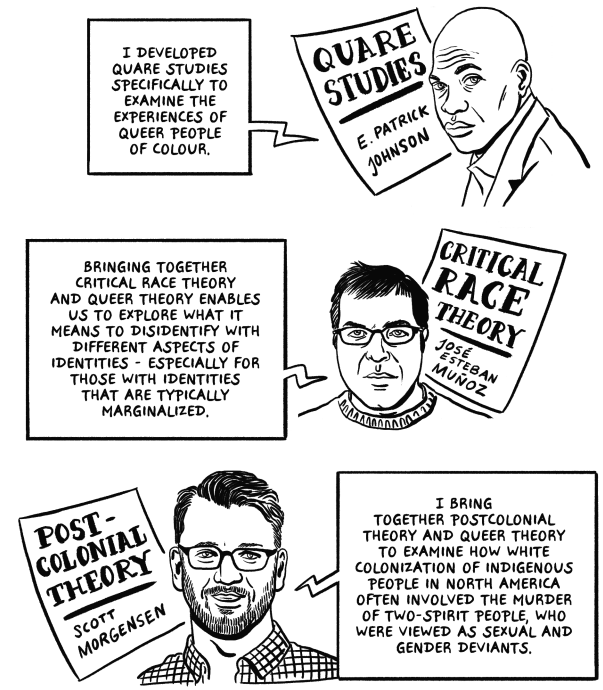 Queer: A Graphic History is structured like an academic text. It has an introduction, signposting of aims (literally), a detailed literature review, a main body of analysis and a conclusion. In many ways, it reads like an academic text. It manages, like many excellent academic texts, to turn a complex subject into an accessible history. 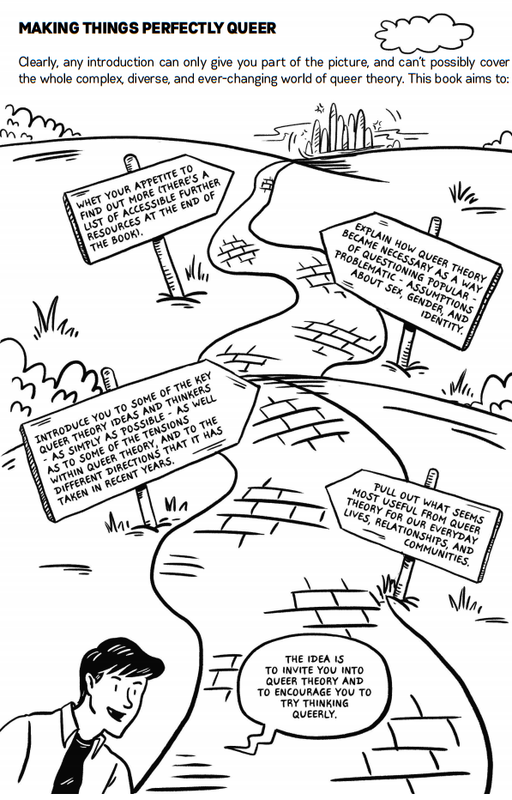 A significant chunk of Queer: A Graphic History might be described as a literature review. Queer theory is placed in its historical context, and the history of queer theory (as different to ‘queer history’) is traced from the late nineteenth century to the present day. Numerous ‘precursors’ to queer theory are identified (existentialists and Kinsey, for example), and queer theory is seen as part of a significant shift in twentieth century thought. There is a focus on particular queer theorists (e.g. Foucault and Butler), but queer theory is succesfully placed in a much broader context. The layout of graphic novels might seem restrictive for a literature review, but it actually works well for an ‘introduction to’ text like Queer: A Graphic History. Speech bubbles are used to summarise the key concepts of theorists. Being restricted to a few lines per idea means they are explained concisely. The clear labelling of texts and theorists means that readers can follow up on the texts they are interested in. Scheele’s illustrations bring the ‘literature review’ alive. I really liked seeing images of the numerous theorists alongside brief explanations of their theories and contribution to the field. Putting faces to big names – Kinsey, de Beauvoir, Lorde, hooks, among many others – made their ideas seem more relatable, less abstract. It also served to hightlight the diversity of people who have contributed to queer theory. Illustrations are also used to explain quite complex concepts. We see Foucault and Butler deconstructing principles of gender and sexuality, and flow charts and diagrams are used to show process of throught in big ideas. The illustrations are often wry and genuinely funny, again making complex ideas far easier to digest. Another way that Queer: A Graphic History makes complex ideas accessible and relevant is through the use of popular culture. Morpheus from The Matrix is used to present and question Butler’s ideas, with the binary code of the matrix running behind him. Ruby Rose, Miley Cyrus and Kristen Stewart are shown explaining their gender and/or sexual identities. There are visual nods to Rocky Horror Picture Show (naturally), and more recent pop culture such as Sherlock. Daniel Craig’s James Bond in Casino Royale is used to explain ‘queer moments’ in culture. These all help to connect those complex ideas behind queer theory with relatable and relatively well known popular culture references. One thing to consider about graphic guides like Queer: A Graphic History is who the audience is. Is it for those who would like to further their limited understanding of queer theory/ists? For people who have no knowledge of LGBTQ lives and/or histories? For LGBTQ people – or people who are unsure about their sexuality and/or gender identity? For graphic novel readers? The introduction to the text explains that some of the readers the authors imagined are those who wonder if they are queer, or are unsure what some parts of ‘LGBTQ*’ mean. Another audience group worth noting is an academic audience – from undergrad to queer theorists and historians. I can imagine this being a useful introduction text to a course on queer theory, and would be interested to hear from anyone who has used this (or any other graphic guide) in an academic teaching and learning environment. Queer: A Graphic History works as a form of public history because it succeeds in breaking down complex ideas in an accessible way. I’m not going to be turning my work into a graphic novel anytime soon, but I can imagine this format working for a broad range of academic work. The graphic novel format is a great way to present narrative histories, and Queer: A Graphic History shows that theories can also be made accessible and attractive by accompanying illustrations. Fittingly, Queer: A Graphic History does an excellent job of disrupting the binary of the academic and public text.